After logging a positive start in early trade, Sensex and Nifty pared gains on account of profit booking in afternoon session. 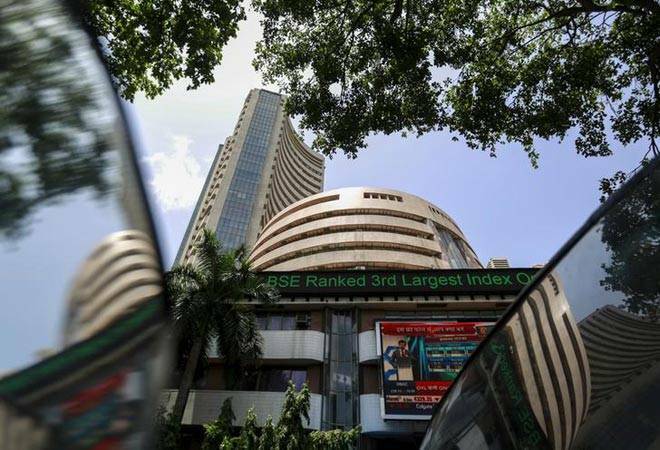 However, bulls refused to be cowed down by bears on Dalal Street as Sensex closed 177 points or 0.46% higher at 38,862 level and Nifty rose 67 points to 11,665 level. Tata Steel (3.36%), Vedanta (2.38%) and Bajaj Finance (2.25%) were the top Sensex gainers. Top losers on the Sensex were SBI (1.46%), PowerGrid (1.36%) and Hero MotoCorp (0.78%). 3: 40 pm: Sensex closes 177 points or 0.46% higher at 38,862 level, Nifty rises 67 points to 11,665 level. 3:29 pm: Bulls refuse to be cowed down by bears as Sensex, Nifty surges log major gains in last 45 minutes of trade. Sensex rises over 200 points to 38,887 level. 3:15 pm: Gold prices rallied by Rs 100 to Rs 32,770 per 10 gram in the national capital on Friday due to increased buying by jewellers, according to the All India Sarafa Association. Silver too surged by Rs 200 to Rs 38,530 per kg on more offtake by industrial units and coin makers. 2:50 PM: Indian Oil Corporation (IOC) stops fuel supply to Jet Airways for non-payment from Friday. Jet Airways stock trading 1.29% lower at 256.60 on BSE. 2:49 pm: Mortgage lender Muthoot Homefin Friday said it plans to raise up to Rs 300 crore through non-convertible debentures. The base size of the issue is Rs 150 crore, with an option to retain oversubscription up to a similar amount, the company said. The company is offering various bonds maturing in 2, 3.2, 5 and 7.5 years, with monthly, annual and cumulative payment options. The effective yield ranges from 9.25 to 10 percent per annum. 2:45 pm: Bank of India Friday said it will sell 25.05 per cent stake in its insurance JV Star Union Dai-ichi Life Insurance Co for at least Rs 1,106 crore. The bank has floated a request for proposal for sale of over 6.48 crore equity shares, or 25.05 per cent stake in its joint venture with Union Bank of India and Japan's Dai-ichi Life Holdings Inc.
2:30 pm: JSW Steel share price rises 2% to 294.85 after firm approves raising of long term funds through the issuance of non-convertible foreign currency/Rupee denominated senior unsecured fixed rate bonds up to $1 billion. 2:00 pm: Metal and IT stocks were fuelling gains on the benchmark indices. While BSE metal index rose 185 points to 11,661, IT index gained 185 points to 15,566. 1:45 pm: Finance Secretary Subhash Chandra Garg has said the government is close to meeting fiscal deficit target of 3.4 per cent for 2018-19. The government in the interim Budget in February revised upward the fiscal deficit target to 3.4 per cent from 3.3 per cent of GDP estimated earlier for the financial year ended March 31. "We are very close to meeting (fiscal deficit)," Garg said when asked whether the government has met fiscal deficit target for 2018-19. 1:18 pm : Ahead of its initial public offer, Polycab India raised Rs 401 crore from 25 anchor investors, according to a release. The company manufactures and sells wires and cables as well as fast moving electrical goods. The initial share sale would open on Friday and close on April 9. 12: 50: Food company Britannia Industries on Thursday said it has raised Rs 500 crore through issuance of commercial paper. "The Company has issued Commercial Papers for an aggregate amount of Rs 500 Crores on April 4, 2019, with tenure upto 260 days," it said in a BSE filing. Britannia Industries owns brands like Good Day, Tiger, NutriChoice, Milk Bikis and Marie Gold. 12: 40 pm: Recouping early losses, shares of Jet Airways were trading marginally lower Friday morning as lenders prepare to invite bids for stake sale in the ailing airline. The scrip was down at Rs 259.15 after opening at Rs 264 on the BSE. Similar trend was witnessed on the NSE where the company's share price fell to Rs 258.85 apiece. It had opened at Rs 260.95 on the broader index. 12:35 pm: Stocks logging top turnover on BSE are Cipla (Rs 218.45 crore), ITC (Rs 59.44 crore) and Dewan Housing (Rs 159.70 crore). 12:15 pm: Tata Steel (2.16%), Bajaj Finance (1.80%) and Infosys (1.46%) are top Sensex gainers. 12: 00 pm: Top losers on BSE are Reliance Communications (4.97%), Shoppers Stop (3.63%) and Syndicate Bank (2.54%). 11: 45 am: 121 stocks hit their upper circuits compared to 124 falling to their lower circuits on BSE. 11: 30 am: 36 stocks hit their 52 week highs compared to 64 falling to their 52 week lows today on BSE. 11: 15 am: Market breadth was positive with 1289 stocks rising compared to 828 shares falling on BSE. 11:00 am: On BSE, Dewan Housing (8.27%) , PC Jeweller (8.47%) and Vodafone Idea (7.59%) were the top gainers. 10:45 am: Cipla share price trading 2.26% or 12 points higher at 533.90 after the company said it has received the establishment inspection report (EIR) for its Goa facility indicating closure of the inspection by USFDA. The US drug regulator carried the inspection at the Goa manufacturing facility from 21-28 January, 2019. 10:40 am: Godrej Properties share price trading over 4% or 37 points higher at 952 level. The stock continued to log gains in today's session as the company announced it would develop a large residential project in Bandra, Mumbai. 10:30 am: Tata Motors top Sensex loser, falls 1.12% to 203.80%. 10: 15 am: Of 3O Sensex stocks, 19 were trading in the green. 9: 55 am: Japan's Nikkei 225 index added 0.3% to 21,794.37 while the Kospi in South Korea was flat at 2,206.76. Shares fell 0.9% in New Zealand and the S&P ASX in Australia dropped 0.8% to 6,128.60. Markets have been wobbly throughout the week as investors wait for the US government's jobs report on Friday and prepare for a new round of corporate earnings reports next week. 9: 40 am : YES Bank (1.42%), Infosys (1.28%) and IndusInd Bank (1.21%) were the top Sensex gainers. 9: 25 am : Top Sensex losers were Asian Paints (0.66%), Hero MotoCorp (0.66%) and Bharti Airtel (0.56%). 9: 21 am: On Monday, Sensex lost 192 points to 38,684 and Nifty fell 46 points to 11,598. 9: 20 am: the mid cap and small cap indices were trading 95 points and 79.67 points higher in early trade. 9:18 am : While Sensex rallied 150 points to 38,835 in early trade, Nifty climbed 48 points to 11,646. 9: 17 am: Market breadth was positive with 1124 stocks trading higher compared to 489 falling on the BSE. 9: 15 am: IT, capital goods and banking stocks lead the gains on BSE with their indices rising 150 points, 152 points, and 144 points, respectively. 9: 10 am: On a net basis, foreign portfolio investors (FPIs) sold shares worth a net of Rs 226 crore on Thursday, and domestic institutional investors (DIIs) were net buyers to the tune of Rs1206 crore, provisional data available with BSE showed.